Dentists and orthodontists both solve tooth problems, but orthodontists don’t do routine cleanings and fill cavities as dentists do. Instead, we have years of specialized medical training to make a child’s upper and lower teeth meet in just the right way to chew food effectively and have a smile worth a thousand words. It’s much easier to brush straight teeth, which means they should last into old age with flossing and regular dental checkups. In addition, when we put a person’s jaws into proper alignment, they have much less risk of getting painful jaw joint conditions like temporomandibular joint (TMJ) dysfunction. With braces now being a rite of passage for pre-teens to living as a teenager, you’d be surprised to find out how soon your child should see an orthodontist. The American Association of Orthodontists recommends that a child gets his or her first orthodontist checkup by age seven. Some orthodontists begin treatment much sooner than that. We do not. Why? Because years of research and experience show that most children gain nothing by beginning treatment before second grade. Typically, a parent needs to leave work early to take her son or daughter out of school for an orthodontic visit. At the average orthodontist’s office, they both wait 30 minutes in a waiting room, then an additional hour while the orthodontist treats the child. The parent then needs to return his or her child to school before returning to work. If you add up the time spent once monthly for two years, that parent has missed almost a month of pay, and her child has missed nearly that much time in school! With our 7 am – 7 pm schedule on weekdays and Saturday hours as well, you or your child won’t ever need to play catch up. We love to tell parents that we saved 2.7 years of missed school last year alone! 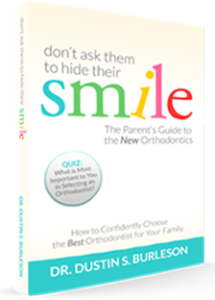 Claim your copy of Dr. Burleson’s best-selling book “Don’t Ask Them to Hide Their Smile: The Parent’s Guide to the New Orthodontics” before choosing your family’s Kansas City, MO, orthodontist. At Burleson Orthodontics, our goal is to achieve both a great smile and a healthy bite. We place special emphasis on interceptive and preventive measures for children. The timing of treatment is very important in obtaining an ideal result and preventing future problems with tooth and jaw alignment. Periodic evaluations allow the doctor to determine how and when best to treat your child’s particular needs. Assessment of facial growth and supervision of eruption of permanent teeth helps to achieve results, which may otherwise be unattainable if treatment were initiated after the jaws have completed growth. Some problems are best corrected when the patient is young and may be recommended with the objective of addressing problems before they develop into bigger ones, obtaining better jaw balance, and allowing room for eruption of permanent teeth. Treatment at the ideal time will save you time and money and help prevent tooth or jaw problems before they become more difficult and more expensive to fix. The overall goal of treatment in our Kansas City orthodontic offices is to reduce the length of time that your child will have their braces on. We pride ourselves on having the shortest treatment times possible, and you will find that we are able to complete your child’s orthodontic correction much faster than what is commonly anticipated. A critical part of achieving this goal is proper timing in placing their braces. Our Pre-Orthodontics Guidance Program allows us to time treatment so that your child will have their braces on the shortest amount of time possible to achieve a beautiful result and wise investment. 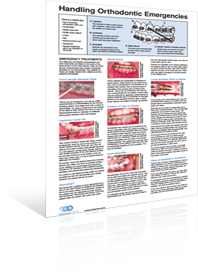 The Pre-Orthodontics Guidance Program, or “Dr. B’s Buzz Club”, includes all of the examinations, the necessary radiographs to assess growth and development and skeletal jaw balance, and any indicated prescriptions regarding possible removal of baby or permanent teeth. The fee for this program will be applied to the future active treatment – there is no additional charge for this service. Burleson Orthodontics takes pride in completing your orthodontic treatment on time and having the shortest overall treatment times for braces. 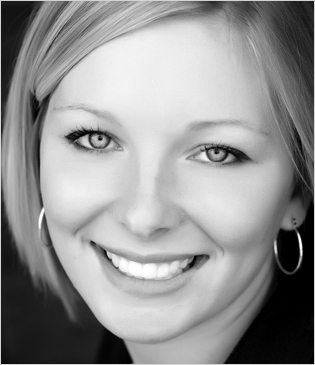 In fact, many of our patients find that their braces can be removed earlier than expected. The key is treatment timing, which Dr. Burleson takes very seriously. We will treat you and your child like we would treat our own family members, with ultimate respect for your time. We invite you to download the New Patient Forms. Your child’s first appointment is scheduled following your initial phone call to one of our Kansas City, MO, orthodontic offices. Following this phone call, a packet of information will be sent to you with information about our orthodontics office and the examination appointment. A health history form and map will be enclosed. During the first appointment, several important things will happen. You and your child will be greeted by the treatment coordinator. 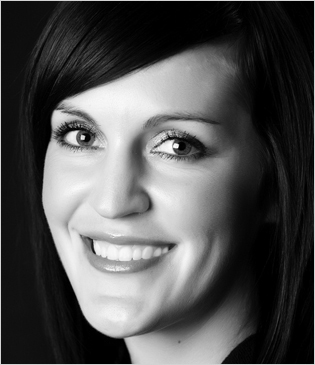 She will review your child’s personal information, health history, and your chief concerns with your child’s teeth and/or smile. 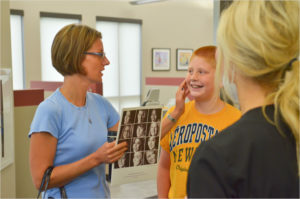 One of our award-winning Kansas City orthodontists will conduct a thorough examination of your child’s face, mouth, teeth, and jaws to determine whether they can benefit from orthodontic treatment and, if so when treatment should begin. 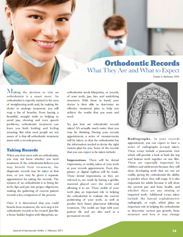 What Should You Expect At Burleson Orthodontics? Watch Our Video To Find Out Now!